The campaign season is already on fire and we’re blazing a trail to win. This is, therefore, a good time to review the work that has to be done. Republicans in this state, and in Legislative District 6, had a significant voter registration advantage going into this campaign cycle. That’s narrowing by the day as a result of hard work. Narrowing, how? Registering new voters. Motivating and persuading independent voters. Improving the likelihood that Democrats will turn out to vote. What kinds of work? 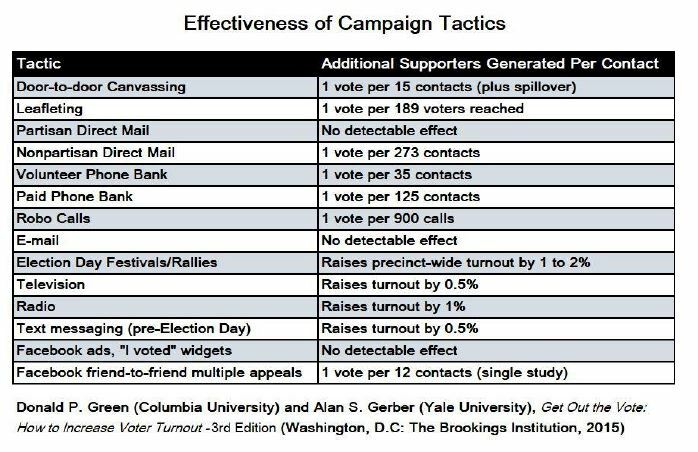 Direct voter contact is the best means of improving voter turnout. The chart below is from a 2015 study. Were it done today, the Facebook ads row might look different and there would be other social media in the chart. Don’t be intimidated by these numbers — the same statistics apply to Republicans. Admittedly, they have more money to waste on Robo Calls, Paid Phone Banks, Rallies, and Television and Radio than we do. But we can do the most productive stuff — door-to-door canvassing, volunteer phone-banking, Election Day events, and friend-to-friend appeals. What do those things have in common? — we need volunteers (and a little bit of money). Help us out today — there’s no time to waste! Note: What does “spillover” mean? It means that the voter you talk to (which is the 1 in 15) is likely to pass on what you say to other voters. Posted in Action Alerts, Latest News and tagged GOTV.